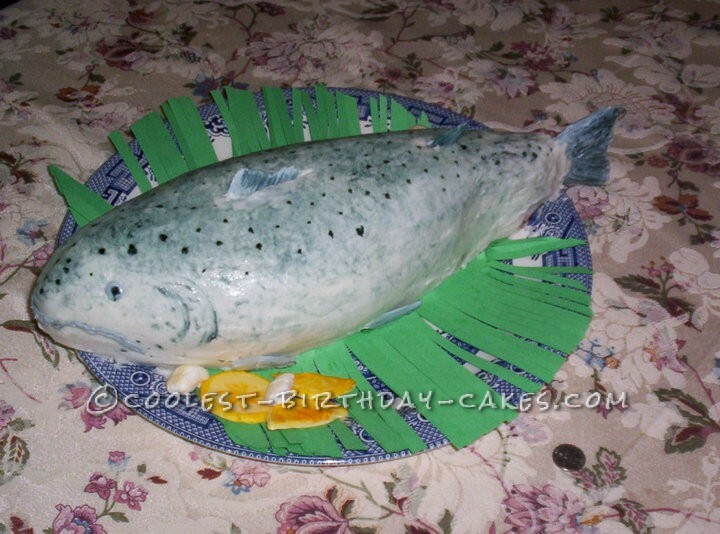 My best friend’s husband worked for a Fishing Club and so she wanted a cake with a fish theme. 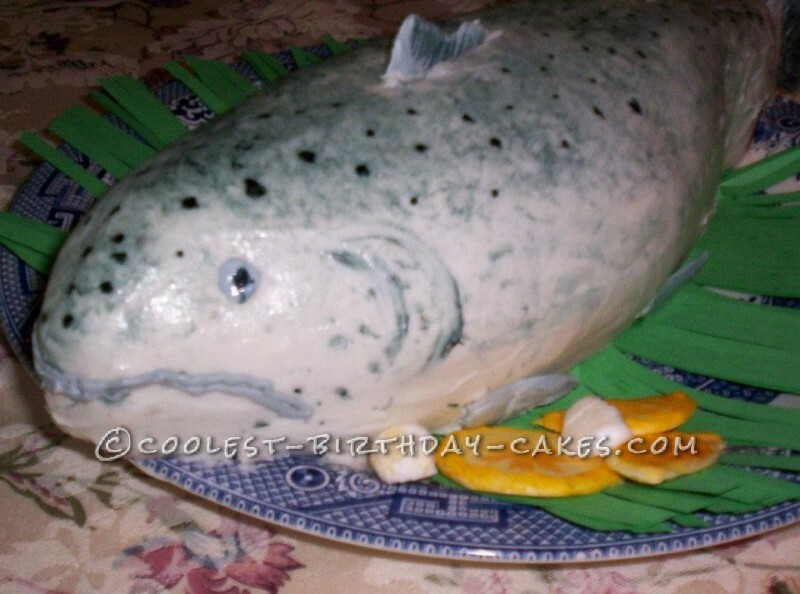 I decided to make a cake that looked like a fish. I went online to get pictures of salmon from different angles so I could make it as realistic as possible without using fondant since nobody likes it. Also I did not have an airbrush so I needed figure out how to get the “mottled” look of the salmon. I started off with two 13×9 inch layers so I could get the almost realistic size in the finished product. I used a basic butter cream icing throughout including the filling. I torted each layer and filled with icing then into the freezer to make sure that it was firm when a started carving. I filled and stacked the two layers and started cutting. I tend to do things freehand but had the pictures close by for shape reference. I rounded the top and sides of the cake until the “fish” started to appear. I started getting excited then, because it looked like it was going to actually look like a salmon. Then to make the “skin”, I started with white butter cream all over for a base and then was stuck as to how to make the moddled coloring of the salmon. Finally, I remembered something from preschool: sponge painting!! I did not happen to have a sponge, at least not a clean one, so I used a wadded paper towel. I just thinned a little of the grey icing with some corn syrup and began at the top and kept dipping and dabbing until it started to resemble the skin of an actual fish. The black dots were made by wetting a toothpick slightly and dipping the tip directly in the black gel dye. Adding the royal icing fins and tail as well as the “lemon” and “garlic” (also from royal icing) my fish was ready to be served up on a platter. Some green craft paper made for the perfect “palm leaf” platter to complete the effect. The guest of honor loved it! The only thing he said that would have made it even more perfect was if I had made the cake a red velvet cake.